The presidential election of nineteen twenty-eight gave American voters a clear political choice. The Democratic Party nominated Al Smith. He was the popular governor of the state of New York. The Republican Party chose Herbert Hoover. He was an engineer and businessman who served as secretary of commerce for presidents Warren Harding and Calvin Coolidge. This week in our series, Rich Kleinfeldt and Harry Monroe tell us about the presidential election of nineteen twenty-eight. RICH KLEINFELDT: Governor Alfred Smith of New York had campaigned for the Democratic presidential nomination in nineteen twenty-four. But he was defeated at the party convention by a compromise candidate, John Davis. Four years later, however, Smith could not be stopped. He had a strong record as governor of the nation's most heavily-populated state. He campaigned for the presidency on a policy of building new electric power stations under public control. Smith knew that many conservative Americans might be worried by his new ideas and his belief in strong government. So he chose as his campaign manager a Republican industrial leader who had worked with General Motors, DuPont and other major companies. Smith hoped this would prove his faith in the American private business system. HARRY MONROE: Al Smith was a strong political leader and an effective governor. But he frightened many Americans, especially conservative citizens living in rural areas. They lived on farms or in small towns. Al Smith was from the city. And not just from any city, but New York City, a place that seemed big and dirty and filled with foreign people and strange traditions. Al Smith's parents came from Ireland. He grew up in New York and worked as a salesman at the Fulton Fish Market. Smith was an honest man. But many rural Americans simply did not trust people from big cities. Al Smith seemed to them to represent everything that was new, different, and dangerous about American life. But being from New York City was not Al Smith's only problem. He also opposed the new national laws that made it illegal to buy or produce alcoholic drinks. And he had political ties to the New York political machine. 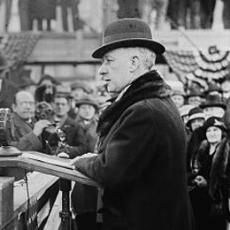 But worst of all, in the eyes of many Americans, Al Smith was a Roman Catholic. RICH KLEINFELDT: From George Washington through Thomas Jefferson, Abraham Lincoln, and up to Calvin Coolidge, every American president had been male, white, and a Protestant Christian. Of course, there was no law requiring a candidate to be Protestant. But millions of traditional Americans just were not ready to give their vote to a Roman Catholic. Opponents of the Smith campaign generally did not speak openly about his religion. But many of them were afraid that Smith would take his orders from the Vatican in Rome, instead of working with the Congress in Washington. Al Smith fought back. He told the country, "I am unable to understand how anything I was taught to believe as a Catholic could possibly be in conflict with what is good citizenship. My faith," he said, "is built upon the laws of God. There can be no conflict between them. " HARRY MONROE: But many Protestant Americans thought there was a conflict. And they looked to the Republican Party to supply a strong candidate to oppose Smith and the Democrats. The Republicans did just that. 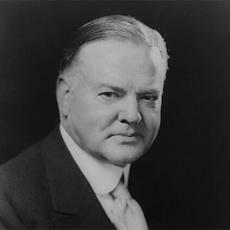 They nominated former secretary of commerce Herbert Hoover, one of the country's most popular men. Hoover was well-known to Americans. People trusted him. And they liked the way he had gained great personal success from poor beginnings. In fact, Hoover's life story would have pleased Abraham Lincoln, another American who rose from a poor family to fame. Hoover was born in the farm state of Iowa in eighteen seventy-four. His father was a poor metal worker who kept moving his family from state to state. Herbert Hoover's father died when the boy was just six years old. His mother died four years later. Young Herbert had to move to the western state of Oregon to live with his mother's brother. Herbert's uncle was luckier in life than Herbert's parents. He had made money in the land business. And he helped the boy gain admission to Stanford University in California. At the university, Herbert showed great skill in mathematics. And he decided to go into business as a geologist studying the science of the earth. RICH KLEINFELDT: After college, Herbert Hoover got a job as a mine worker. During the next several years, Hoover spent most of his time working as an engineer in foreign countries. And he succeeded beyond his greatest dreams. By the time he was forty years old, he had earned more than one million dollars. After World War One, he organized the effort to provide food for starving people in Europe. He did an excellent job, winning praise from people in Europe and the United States alike. 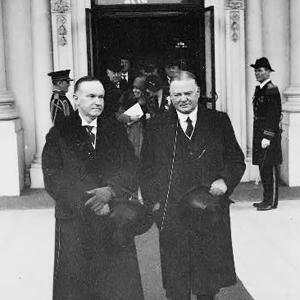 Next, Hoover joined the administration of President Warren Harding, serving as the secretary of commerce. Again, he did a very good job. Hoover left the cabinet in nineteen twenty-five. But two years later, he organized efforts to provide relief for victims of a flood in the southern state of Mississippi. And again, Americans all around the country took note of this quiet, serious man who did such effective work in so many different kinds of situations. Some Americans, however, did not like Hoover, including some people who usually supported Republicans. For example, many professional Republican politicians did not trust him, because he had spent most of his life in business, not politics. Some stock market traders thought Hoover might change the rules on the New York Stock Exchange. And many farmers believed Hoover had no new ideas about how to solve their growing economic problems. HARRY MONROE: This, then, was the choice Americans faced in nineteen twenty-eight. On the one hand, Al Smith. A Democrat. A Roman Catholic. A politician from the city. A man wanting some social change. And on the other hand, Herbert Hoover. A Republican. A businessman who had proven the dream that even a poor boy could become great in America. A man who seemed to succeed with every effort he touched. The main issue in the campaign was not economics or religion, but the new national laws banning alcoholic drinks. Hoover was for the laws; Smith against them. The two candidates also argued about how to provide aid to struggling farmers, and how to increase electricity and water supplies. RICH KLEINFELDT: Herbert Hoover won the election of nineteen twenty eight. It was one of the greatest victories in presidential history. Hoover won fifty-eight percent of the votes. Smith got just forty percent. And Hoover captured four hundred forty-four electoral votes to Smith's eighty-seven. And so it was that the engineer and businessman Herbert Hoover entered the White House in nineteen twenty-nine. There was some trouble the day he moved in. Outgoing President Coolidge was a man who watched every dollar he owned. And he accused some White House workers of stealing his shoes on the day of the inauguration. But -- finally -- safe, conservative, business-like Herbert Hoover was leading the country. HARRY MONROE: The nation's stock market reacted by pushing stock prices to record high levels. Everyone expected that economic growth would continue and expand. But the happy times were just a dream. Within one year, the stock market collapsed. Millions of people lost their jobs. The nation fell into the worst economic crisis it had ever faced. Herbert Hoover was not personally responsible for the crisis. In many ways, it was his own bad luck to be elected just before the disaster struck. But it was his job to guide the nation through its troubled waters. And he would prove to be the wrong person to give such leadership. His four years in office would be one of the most difficult periods in the nation's history. We will look at President Hoover's administration in our next program. BOB DOUGHTY: Our program was written by David Jarmul. The narrators were Rich Kleinfeldt and Harry Monroe. You can find our series online with transcripts, MP3s, podcasts and pictures at www.unsv.com. You can also follow us on Facebook and Twitter at VOA Learning English. Join us again next week for THE MAKING OF A NATION -- an American history series in VOA Special English. his four years in office would be one of the most difficult periods in the nation's history.